I recently reviewed TAP Portugal's service from Lisbon to London, which I characterized as Good value, but utter chaos that makes a bad experience. Sometimes people have a bad day, though, so we'll always give airlines the benefit of the doubt, particularly when they've treated us to the kind of exceptional regional travel service we experienced with TAP between Seville (Spain), Lisbon, and Porto. If you love spending time on the Iberian Peninsula (that's Spain and Portugal, for the geographically uninitiated) as much as we do, it's entirely likely that TAP will be a big part of your plans. Our review is below. Online check-in seems to work well -- even if you're not a frequent flier and therefor don't have the mobile app installed -- the mobile site worked well each time we used it, and allowed us to download boarding passes to Passbook on our iPhones. We opted for a cab to the airport from our hotel in Seville's historic center. 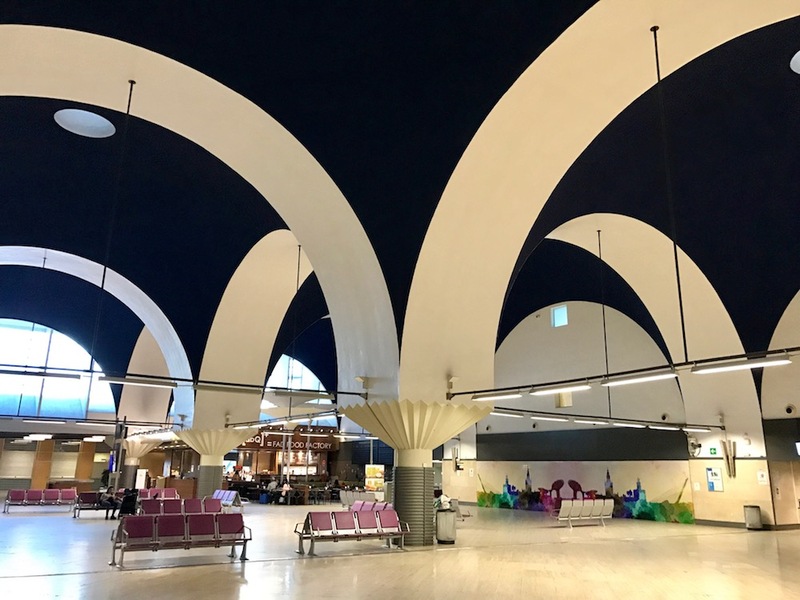 The ticketing concourse at SVQ is quite striking architecturally, with arches and vaulting boldly painted in contrasting black and white. We were surprised by the non-existent lines for an airport serving a city of this size. For context, Seville's population ranks between the 17th and 18th largest cities in the United States, Charlotte and Seattle, whose airports move 44.4 and 45.7 million passengers per year respectively; SVQ moves 4.3 million each year. Obviously there are a lot of variables here (SVQ is not a hub, for example), but all suffice it to say that we found the overall airport experience to be quite pleasant and laid back. We've reviewed the airport experience in Lisbon separately in Navigating Lisbon Airport: A mixed bag with some great deals on trans-Atlantic flights. Baggage is my number one complaint about TAP. First, their published dimensions don't use the standard "international" carry-on size of 22 x 14 x 9 inches, rather opting for a bizarre 23 x 15 x 8 that isn't helpful if you've outfitted yourself to comply with a lot of the big carriers including all of the American ones as well as the British Airways - Iberia - Aer Lingus airline triad. Second, TAP's draconian weight limitations are the stuff of legendarily heinous overage charges. Carry on at your own risk. We found sandwiches and a bottle of Rioja for dinner at our gate in Seville. Sadly, we didn't get to finish it all, because the TAP gate agents meant business when it came to getting this plane boarded on time. Boarding and departure in both Seville and Lisbon were extremely prompt, so we'd recommend making a point of arriving at the gate before boarding is scheduled to begin, lest you miss your chance. We walked outside onto the tarmac and up the build-in boarding stairs to enter having chosen our seats online at check-in. We couldn't get over how efficiently this was handled. This was a fairly straightforward experience overall. We were surprised to be flying the ATR 72-600 propeller-driven airplane on both legs, but particularly so between Portugal's two largest cities, but were pleasantly surprised with the comfort and quality of the ride in these new-feeling aircraft. American travelers with prop experience should not confuse TAP's 70-seat ATRs with the experience flying the much smaller and more worn out prop planes sometimes found on low-volume routes in the United States. TAP knows how to do this well. When choosing a seat, note that passengers enter from the back of the aircraft, so those wishing to sit near the door should counterintuitively choose higher number rows (though we always recommend avoiding the last row at all costs). There's no first or business class on this flight at all. Overhead bins are small on the 72-600, but actually a trifle bit larger than we expected. We're torn as to whether the Tumi Alpha 2 International Spinner Carry-on (measuring 22x14x9 inches) would fit -- there's a chance -- but in any case we had checked our bags so did not have the opportunity to experiment. Seats are of that new(ish) thin profile, leather(ish) construction with tight, but doable pitch (legroom) between. The tray tables are quite miniature, but the seat backs do offer the double pocket / plastic magazine rack that we like. In-flight experience was fine. The friendly crew on the international flight between Seville and Lisbon served a small sandwich and a glass of wine, while the equally friendly crew on the domestic flight up to Porto offered a quick non-alcoholic beverage served without any food. As mentioned, the ride is quite smooth on these planes. Overall a nice yet uneventful flight, and one of the best "commuter" type flights we've been on. We'd recommend them for hopping to and fro between Spain, Portugal, though we might tend to prefer to the great scenery of a train if staying domestic. The efficiency with which TAP's commuter service was offered gives us definite reason to try them again -- perhaps trans-Atlantic -- to get a true sense of how they perform overall.